Russians have taken to social media to demand retribution after an investigation determined that the crash of a Metrojet A321 airliner in Egypt last month was caused by a bomb. But at the same time some pointed the finger at President Vladimir Putin, arguing that the military campaign in Syria has made Russia a target. Image caption Translation: "'We will find and punish them wherever they may be on the planet!' 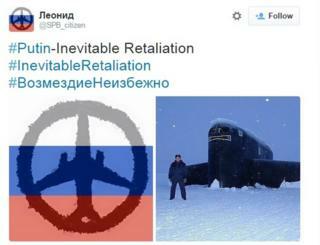 - Vladimir Putin"
Many, such @SPB_Citizen (who posted the tweet at the top of this article) replaced their profile pictures with a collage showing an outline of an airliner against the background of a Russian flag - an image reminiscent of the Eiffel Tower "peace" icon making the rounds following the Paris attacks. The Russian plane icon was first shared on Facebook by Maria Zakharova, a spokeswoman for the Russian Foreign Ministry, shortly after the announcement about the investigation. She said she had received the picture from someone in Italy, accompanied by one word: "Solidarity". But others suggested that Putin was himself indirectly responsible for the tragedy, and claimed the Kremlin's bombing campaign in Syria has turned Russians into a target for militants. "Human lives have been paid for the help given to Al-Assad and for Putin's scheming. These human lives cannot be brought back," tweeted Nikolay Polozov, a prominent opposition-minded lawyer. Image caption In this cartoon being shared online, Putin hurls a plane while shouting "Syria!" - but in return gets peppered with debris from the bombed plane and a shout of "Russia!" President Putin's popularity may be at an all-time high now, but a protracted battle with insurgents in Syria might seriously dent it, especially if there are high numbers of casualties. Russia is a country which still grapples with painful memories of a bloody and unsuccessful Soviet military campaign in Afghanistan in the 1980s.